Along the same lines of the cheese carts we’ve seen at Meritage and Heidi’s, The Bachelor Farmer’s cute red trolley wheels about the dining room serving pastries—absolutely do not miss the fluffy rolls filled with a divine sort of cardamom crème anglaise—and sparkling wines by the glass. Marvel Bar mixmaster Pip Hanson has created a list of alcoholic breakfast beverages of equal caliber to those served in the evening. Day Drinks constitute everything from Breakfast Whiskey (bourbon, smoked maple syrup, and bitters) to three variations on a G&T, including one with a glass full of sliced citrus. The Coffee Flip is an intense blend of bourbon and espresso, with the frothy, velvet texture provided by a whole egg—and it’s probably a little rich for summer’s swelter. If the weather’s hot and humid, try the aquavit-and-caraway-spiked shandy instead. It’s ultra refreshing, with just the right sweet/tart attack and dry/spicy finish that makes it the best version of the beer-lemonade beverage I’ve ever had (Leinenkugel’s chemical-tasting Summer Shandy being the worst). You’ll sound like a dying cow trying to pronounce it, but who cares. 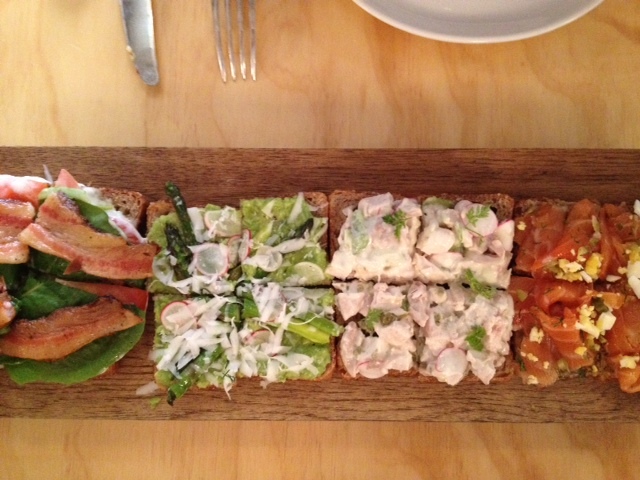 The Scandinavian open-faced sandwiches (the term translates to “butter and bread”) are well worth the embarrassment—not that the Bachelor’s cheery staff would ever judge. The sandwiches are a nice variant of the restaurant’s popular toasts: the chicken salad, cured salmon, and pea/asparagus/goat cheese toppings are good, but the bacon confit is outstanding. Thick slabs of pork belly are layered simply with crisp lettuce, tomato, and aioli to handily blow the average BLT out of the water. I’d love to see the kitchen add a shrimp option like the one they’ve offered as a special toast. That right there will be enough food for two, so the duck heart omelet, the egg sandwich, the bourbon-brioche French toast, and the rye spaetzle/pork shoulder hash will have to wait ‘till your next visit. The new menu is served from 10 a.m.-3 p.m. (Sunday supper, a family-style set meal, is served 5-9:30 p.m.). No reservations available on Sundays—seating is first-come, first-served.